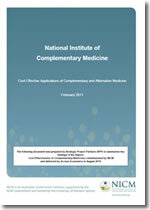 Australian consumers have embraced the use of complementary and alternative medicine (CAM). Two in three Australians have used complementary medicines over the past 12 months and approximately 42% of these use CAMs to prevent or manage chronic, high priority health problems. The growth in use of CAMs over recent years is supported by a growing body of scientific knowledge on their effectiveness and understanding of how they work. However, the widespread use of CAMs in Australia is not yet reflected in national health policy or in the scale of quality information available to inform health practitioners and consumers on the most appropriate CAM use. The National Institute of Complementary Medicine (NICM) was established to provide leadership and support for strategically directed research into complementary medicine and translation of evidence into clinical practice and relevant policy to benefit the health of all Australians. An herbal combination for osteoarthritis.